My Auntie Lesley went to Greece to see some of my relatives. Lots of people call them loggerhead turtles. They are gorGEEous sea turtles! But not everyone calls them loggerhead turtles. Animals have science names, too. Those names are Latin names. 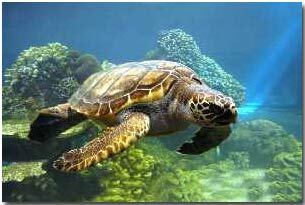 The loggerhead's science name is caretta. But here's what my Auntie Lesley found out about loggerhead turtles in Greece. The Latin name for the Loggerhead Turtle is Carretta Carretta. In Greek the word carretta means wheelbarrow, so the guide told us that they are literally called wheelbarrow wheelbarrow. They are a whole lot bigger than a wheelbarrow, though. The one that we saw in the harbour was huge. If you know any interesting facts about any of my relatives, please let me know. I am trying to learn all I can about my heritage. And I want to share all I know with everybody else who visits my Web site. Learn more about my Auntie Lesley's trip to see Caretta Caretta on Turtle Island.